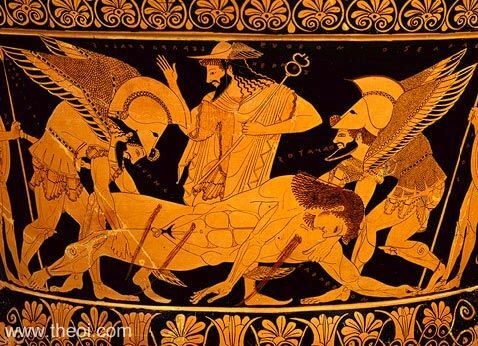 The winged gods Thanatos (Death) and Hypnos (Sleep) carry the body of Sarpedon from the battlefield of Troy. The pair are depicted as armoured warriors with crested helms. They are overseen by Hermes Psychopomp (Guide of the Dead) who wears a winged cap and boots and holds a herald's wand (kerykeion) in his hand.